With the rising trend of interactive learning in the education sector, the demand for interactive projectors has increased substantially across the sales of interactive projectors, globally, leading to noticeable rise in the global market for interactive projectors. Over the coming years, the constant technological advancements in the education, as well as the corporate sectors will continue to support this market considerably. The increasing trend to optimize the training costs among companies, in a bid to improve employee productivity, is also projected to add to the growth of this market over the next few years. The global interactive projectors market stood at US$0.99 bn in 2016. Progressing at a robust CAGR of 21.80% between 2017 and 2025, the market is likely to reach US$5.97 bn by 2025 end. The global market for interactive projectors is analyzed on the basis of the product type and the application. Based on the product type the market has been classified into ultra-short throw, short throw, and standard throw. The demand for ultra-short throw is greater than other products and the trend is expected to continue in the years to come. Based on the Application, the market is segmented into the education, corporate, and the government sector. Among these, the education sector holds the leading position and is projected to remain doing so over the forthcoming years, thanks to the increasing uptake of advanced technologies by educational institutes and the rising trend of interactive learning. 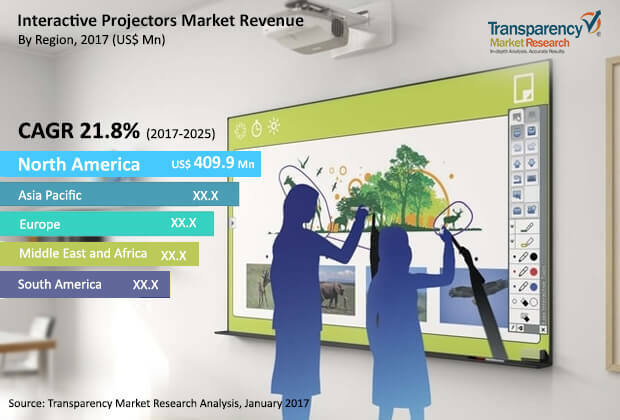 The worldwide interactive projectors market has been classified into five geographical segments, namely, North America, Europe, Asia Pacific, the Middle East and Africa, and South America. Among these, North America has been the leader and is expected to remain dominant over the forecast period, thanks to the presence of a number of technologically advanced and feature-rich products in a bid to improve the productivity and the meeting room experience. The presence of a large pool of interactive projector providers in the region is also supporting the North America market for interactive projectors. In addition, the rising demand for interactive projectors and the increasing technological developments are expected to boost this regional market in the years to come. The advent of faster telecommunication technologies and networking and the increasing government support to education sector, in terms of funding, are also projected to boost the interactive projectors market in the region over the next few years. Among others, the Asia Pacific market for interactive projectors is anticipated to report a significant growth over the forthcoming years, rising at a CAGR of 24.30% between 2017 and 2025. The increasing consumer awareness and the gradual increase in government spending on the education sector are expected to aid this regional market in the near future. The global market for interactive projectors is highly competitive. The leading companies are emphasizing on technological advancements to strengthen their position in this market. Dell Technologies Inc., Optoma Technology Inc., Hitachi Ltd., BenQ Corp., Sony Corp., Touchjet Inc., Seiko Epson Corp., Boxlight Mimio, Panasonic Corp., and NEC Display Solutions are some of the prominent vendors of interactive projectors across the world. The Interactive Projectors Market report provides analysis of the interactive projectors market for the period 2015–2025, wherein the years from 2017 to 2025 is the forecast period and 2016 is considered as the base year. Data for 2015 has been included as historical information. The report covers all the trends and technologies playing a major role in the interactive projectors market growth over the forecast period. It highlights the drivers, restraints and opportunities expected to influence the market growth during this period. Key indicators mentioned in the report provides a robust view about the vital factors that led to the strong adoption of interactive projectors solutions around the globe. The key indicators also provide significance of the factors which are capable of changing the market scenario. These indicators are expected to define the market position during the forecast period. The study provides a holistic perspective on the market’s growth in terms of revenue (in US$ Mn & Thousand Units) across different geographical regions, namely North America, Europe, Asia Pacific, Middle East & Africa and South America. Report highlights the key trends affecting the market on a global scale. Furthermore, region wise prominent countries/regions covered in the report include - The U.S., Canada, Germany, France, the U.K., India, China, Japan, GCC, South Africa and Brazil. The product type segment includes ultra-short throw, short throw, and standard throw. The application segment includes education, corporate and government. An attractiveness analysis has also been provided for every segment in the report, in order to provide a thorough understanding of the overall scenario of interactive projectors market. Moreover, the report provides an overview of various strategies adopted by the key players present in the market in company profile section. The report also includes key industry developments covering significant advances made by leading market players over the period of time. The report also highlights the competitive landscape of the global interactive projectors market, thereby positioning all the major players according to their presence in different regions of the world and recent key developments initiated by them in the interactive projectors market. The comprehensive interactive projectors market estimates are the result of our in-depth secondary research, primary interviews, and in-house expert panel reviews. These market estimates have been analyzed by taking into account the impact of different political, social, economic, technological, and legal factors along with the current market dynamics affecting interactive projectors market growth. Seiko Epson Corporation, BenQ Corporation, Touchjet Inc., Dell Technologies Inc., Optoma Technology Inc., Panasonic Corporation, Hitachi Ltd., Sony Corporation, Boxlight Mimio and NEC Display Solutions, Ltd. are some of the major players operating within the interactive projectors market profiled in this study. Details such as financials, SWOT analysis, business strategies, recent developments, and other such strategic information pertaining to these players have been duly provided as part of company profiling. This report provides all the essential information required to understand the key developments in interactive projectors market, growth trend of each segment and strategy of each company that helps them to efficiently compete in the market. Also, the report provides insights related to trends and its impact on the market. Furthermore, Porter’s Five Forces analysis explains the factors which are currently affecting the interactive projectors market.